Sometimes I have trouble remembering exactly how and why I formulate goals for myself. Such is the case with my current goal of becoming a European highpointer, that is, traveling or climbing to the highest point in elevation in each of the countries on the continent of Europe. You could say hiking and a love for the mountainous outdoors has always been with me from childhood. I went winter camping with my parents when I was only 11 days old. I then did quite a bit of winter hiking from age 7 to 10, in the local Adirondack Mountains of New York where I grew up. In fact, for some time, I was the youngest person to hike a group of 46 mountains in the winter in the Adirondacks called the High Peaks. And now even as I finish my fourth year at a Christian liberal arts college in Pennsylvania, I still have not lost my love for mountains, for wilderness, for God’s natural creation. I find that I can not help but to wonder and marvel at Creation when I spend time in it, and praise the creator. In fact, most of my sports and hobbies that I love are in some way connected to the mountains and nature. I love landscape and wilderness photography, snowboarding, mountain biking, kayaking, hiking, climbing, mountaineering, and pretty much anything else that involves a significant change in elevation. Sometime while attending college, I developed the goal of driving, walking, hiking, or climbing to the highest point in each of the 50 US states. I spent part of each summer with my family, as we traveled around the country in pursuit of this goal as a family, along with my 4 younger brothers who happen to have the same goals as I do. This goal and mindset of always wanting to go to the highest point of wherever I am influenced me as I traveled abroad also. My first highpoint outside the US was on Mexico’s Pico de Orizaba, with a paid group from the US. I am fortunate to have parents that support me in such endeavors, and am grateful that they are more willing to spoil me with experiences than with material possessions such as cars. Right after I climbed this peak, I spent a semester studying abroad in Athens, Greece, through a program from my college. On the weekends, I would usually travel with the other students to the Greek islands or to sites of historical significance. But for whatever reason, I set aside a long weekend to travel north by train to Mt. Olympus, in order to climb the highest point in Greece. Unfortunately, when I did go (with a couple fellow students), we found there to be too much snow still on the slopes of that steep mountain, and didn’t summit. But after that weekend, I became preoccupied with attaining that highpoint, and finally spent part of my 2 weeks of free travel at the end of my semester there re-climbing the mountain, this time successfully, as well as flying to Andorra to hike in the Pyrenees mountains. After this experience at the end of my sophomore year, I temporarily stopped thinking about European highpoints, but the longer that I stayed settled into college life, the more I began to yearn spending time in the mountains again. In contemplating my [still unfinished – I have done 43 out of the 50 highpoints] goal of becoming a state highpointer, I realized that I was going to be only one of many to accomplish this feat. Now of course, ‘many’ is a relative term, but for me, being the several hundredth person to become a highpointer didn’t seem all that amazing or glorious. Don’t take me wrong, I still want and plan on climbing these highpoints, but I have realized that I am a person who likes to stand out. I do not like to follow a crowd, but love to always keep people guessing about me. This is actually something I have learned about myself while at college. So, applying this new self-realization to my wilderness and mountain pursuits, I came up with the idea of trying to become a Canandian provincial highpointer. After doing some research on the internet I learned that this feat has only been accomplished by one man so far, Jack Bennett. I reasoned that this was truly a unique and noteworthy goal, and loved the idea that few had even heard of this goal, much less accomplished it. I also liked the idea that this pursuit would bring me to remote wilderness areas, such as the Northwest Territories and Nunavut. Thus, my goal to become a Canadian Highpointer was born, and since then I have managed to attain one of the provincial highpoints, Ishpatina Ridge of Ontario, with plans to go to several more this coming summer with my faithful family. This past summer, the summer before my senior year, I went on a 10 week summer study tour with a group of fellow international business students from a consortium of Christian colleges. We traveled through 11 different European countries, taking classes with professors on the road, visiting sites of cultural interest, banks, parliaments, and corporations, and applying what we learned in the real world to what we were learning academically. During this time in Europe, the schedule allowed us students to stay in a conference center in Oisterwijk, northern Netherlands, for 3 weeks to have a period free of travel but with intensive classes. It was during this time that I became curious about the highpoint of The Netherlands. If I was going to live in The Netherlands for three whole weeks, I could not pass up the opportunity to go to the country’s highpoint. It didn’t matter to me where it was, or how high it was. 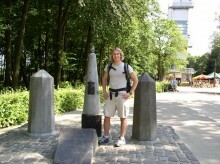 In fact, I was made fun of for going to the highpoint of the “Low Countries”. 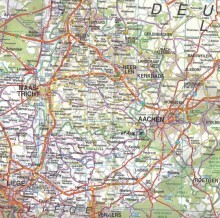 So I rode my rented bicycle into town to a gas station, and bought myself a map of the Benelux countries (BElgium, NEtherlands, and LUXumbourg). After studying this map, and finding one or two websites of others who had gone to the highpoints of these countries, I couldn’t resist the wonderful opportunity I had, in terms of my location in Europe. So, the next Saturday morning, which I had free, I packed a change of clothes, a camera, my passport, my sleeping bag, and my maps into my backpack and secretly took off. I knew that the professors in charge of us probably wouldn’t like me running off in a foreign country, and I also knew that I was supposed to be back for a midnight curfew, so I decided to follow my “ignorance is bliss” philosophy and not tell anyone except my dear mother what I was up to. I rode my bike to the train station in town, and bought a weekend roundtrip ticket between Oisterwijk and Maastricht, in the south of the country. 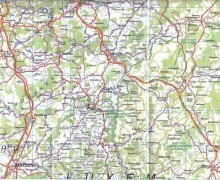 I knew by examining my road map that the highpoint was “kinda near” Maastricht, and that was the nearest major train station. Of course, I really didn’t know how I was going to get from the Maastricht station to the highpoint near Vaals, but I decided not to worry about that until the time came. Such is adventure and freedom! In fact, traveling alone in a foreign country really makes me have faith and trust God more. Perhaps that is why I love it so much. It is amazing to see how God works in your life, and answers prayer, when you have faith in Him and fully rely on Him. I find that when I am in the US, I have plans, and backup plans, and I rarely leave room for me to need to rely on God. But when in Europe, where fewer people understand you, and fewer still know you, you really learn to trust God and pray with faith. Well, as it turns out, at the train station I was able to locate a public transit bus that was going right to Vaals, which was the nearest town the highpoint. (Public transportation seems much more developed and accessible in Europe than it does in the US). 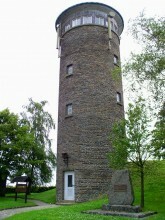 At Vaals, I stopped in a little store and asked for directions to the highpoint, Vaalserberg. I knew that this particular highpoint had an observation tower on top, and therefore a road up it. I started out hiking up the right road, but then got lost. So I decided to just make a beeline for the top of the hill I was going towards, and followed a little path through the woods. I emerged from the woods back onto the correct road, at the parking lot for the observation tower. It was somewhat discouraging at this point, however, because I realized that this was a top weekend destination for the locals to drive to with their families. Here I was, hiking up the hill, while all these people apparently just drove up on some road I must have missed. I located the highpoint of The Netherlands, and made sure I had someone take a picture of me and the benchmark. By this time, it was mid-afternoon. I knew that if I had a car, the driving time to Belgium’s highpoint from this location was less than an hour, and Luxmbourg’s one more hour. I also knew that if I headed back ‘home’ now, I could still make it that evening. However, the highpoint of another European country was only an hour away- an irresistible prospect. So I headed down the other side of the hill walking into Belgium, with the idea to walk to the next nearest town, and find a bus going in the direction of Belgium’s highpoint, Signal de Botrange. 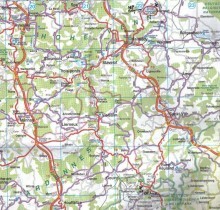 After a couple miles of walking on the country road, I came to the town I had previously spied on the map. Finding the curbside bus stop in the town proved to be a bit challenging though, especially when no one spoke any English. I was able to take a little roadside nap before the next bus came, and then when it did come, I paid my fare in Euros and boarded. While the driver was maneuvering the bus through the picturesque villages, I pointed to the spot on the map where I presumed the highpoint of Belgium was, and asked him how to get there. Thankfully, he told me he would drive me to a bus station where I could pick up another bus, one that would take me right by Signal De Botrange. I got on the last bus of the day, and rode that for another 30 minutes or so, until I spotted the roadside building near the highpoint that I had seen in pictures I found on the internet. By this time when the bus dropped me off, it was late afternoon, and beginning to rain. Of course, I didn’t have a tent, and this was a rural area, so after having snapped a couple pictures of me crouching next to the monument at Belgium’s highpoint, I decided to keep moving south, towards Luxembourg’s highpoint. Time was short, and there was nothing I could do at Signal de Botrange except to wait around for the next day’s bus. I started hitchhiking, and caught a ride into the next town. By this time, however, it was dusk, and few cars were on the road. So, I decided to start jogging to the next town several miles south, and closer to the Luxembourg border. I spied on my map a railroad station a couple miles down a track that passed over the road I was jogging on. I climbed up to the track, but saw that the rails were rusty, a clear sign that this track was inactive. However, also saw on the map another track merging with the one I was on a couple miles down, and reasoned that if this other track were used, I could get to the station by following the track, and get an early morning start either towards the Luxembourg highpoint, or back north towards my worried professors. Unfortunately, after jogging down the track towards the station, it turned out the rails of this other track were rusty also. By this time is was almost completely dark, and I found myself in the middle of pastureland with no motels or even houses around. So I spied a flat area of pasture with shorter grass, underneath a couple pine trees, hopped over a couple barbed wire fences, and laid out my sleeping back directly onto the wet grass. It was difficult finding a large enough patch of grass that didn’t contain dried cow droppings, but I think I found one. As I fell asleep in the middle of the cow pasture, I thanked God for helping me to get to the two highpoints, and for my sleeping bag I had almost decided not to bring, when I left in the morning. At this time, however, I could see thunderclouds rolling in over my head, and started to feel drops of rain on my face. I earnestly prayed to God that he would not let it rain on me, since I had no tent, and couldn’t afford to get my down bag soaking wet. Even though I could see no patches of clear sky anywhere, and the weather looked ominous, I quickly fell asleep with peaceful assurance and faith that God would answer my prayer. As it turned out, when I awoke early the next morning, I was completely dry! God had indeed answered my prayer. I packed up my stuff, ate the last of what little junk food I had bought, and jogged into the nearest town a couple miles away. I found a grocery store and bakery, and shopped in both. However, at this time, I realized I needed to call the conference center back in Oisterwijk to let the professors know that I was okay, and planning on returning that evening. However, it was a Sunday morning, and I couldn’t find any store open that sold a calling card, and I didn’t have the access number for Belgium for the AT&T calling card I had with me. So, I gave up on that idea, and found the nearest bus stop, still with the intent of continuing south to the highpoint of Luxembourg, Burgplatz. To my delight, I “read” in Flemish that a bus was supposed to stop there in half an hour. However, and hour later, there was still no bus, and after scrutinizing the bus schedule sign again, I realized I had looked at the schedule for Saturday, and not for Sunday! There was no bus coming after all. So, I started jogging and kept my thumb out as cars passed me. Finally, one nice Flemish gentleman stopped, and gave me a ride to the next major town. I kept jogging, and crossed the border into Luxembourg, and then a couple picked me up. I explained to them the best I could that I was wishing to go the highpoint of Luxembourg, and I showed them a picture of the stone tower at the highpoint, that I had printed off the internet before leaving on this adventure. To this day I don’t know if they were really going in that Burgplatz, highpoint of Luxembourgdirection or not, but they ended up driving me right to the base of the hill where the highpoint was. I jogged up the road to Burgplatz, took a documentary photograph, ate a quick lunch, and then started jogging towards a town about 8-10 miles away, which I knew to have a train station. I didn’t have as much fortune with hitchhiking this time, and arrived tired and sweaty at the station at around 2 pm. Thank God, I was able to buy a ticket from there, through Belgium, and right to Maastricht, for a reasonable price. I got to Maastricht at around 7 pm Sunday night, and caught my return train back to Oisterwijk by 10 pm. Needless to say, I walked into the conference center both a hero to the students and a rebel who needed admonishing to the professors. The professors in charge of us students sat me down, and told me they had actually contacted the Dutch Police to file a missing person’s report. Thankfully, however, before they did that, they called my mom, who, bless her heart, told them not to worry, and that I was fine and probably just stuck somewhere in a train station. I learned a bit more about responsibility from this experience, and was grounded for the next week, but I also accomplished my goal of visiting the highpoints of three more European countries. Looking back on it, it was a time when I exerted my adventurous spirit, but I also really relied in God more. Sometimes I am asked whether I ever get lonely on these solo adventures of mine. The truth is despite my independent nature, I do, but I cannot imagine doing the things I do without a Father in heaven looking out and caring for me. The rest of the trip was less eventful, and I didn’t leave the group anymore! However, at the completion of the program, instead of flying back to the states in early August, I decided to fly east to Sofia for two weeks, so I could have additional time to hike in the Rila Mountains of Bulgaria and the Fagaras and Retezet of Romania. Of course, in these ranges lie the highpoints of these European countries. But that is another adventure!